SSL checker https://www.ssllabs.com/ssltest/ and web browser report that certificate for mail.example.com is valid and up to date. 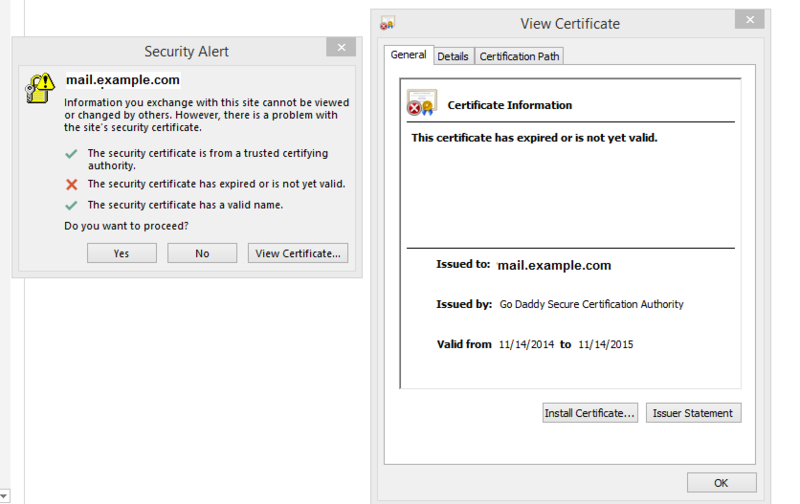 Wrong certificate is set up for mail server in Plesk UI. Note: the domain name of mail server specified in mail client's settings must match domain name in the SSL/TLS certificate. Otherwise, SSL/TLS connections mail client will report about certificate issues. In Plesk go to Tools & Settings and click SSL/TLS Certificates. Click Change next to Certificate for securing mail > select the valid certificate > click OK.
How to configure the secure connection for an email client?